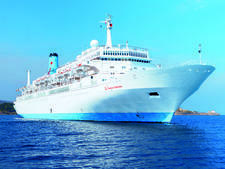 Following hot on the heels of Marella Discovery, which joined Thomson (now Marella) Cruises in 2016, Marella Discovery 2, reinforces the sea change that is steadily transforming this fleet. 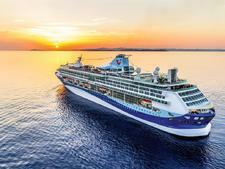 While last summer's arrival of Marella Discovery marked a major step forward for the line; the addition of her new sister -- and new flagship -- in May 2017 is clearly propelling this tour operator cruise line to a new level. 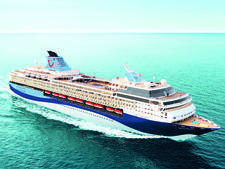 Like its sister ship, Marella Discovery 2 has come from U.S. line Royal Caribbean International where it sailed as Legend of the Seas and has arrived sporting a similar contemporary look, along with many of the same facilities and attributes. There's a feeling of light and spaciousness that flows through the public areas, along with striking artworks that include stylish monochrome shots of Marella Discovery 2 in the shipyard during a six-week multi-million-pound bow-to-stern refit. This successfully stamped the tasteful Marella look throughout the 1,830-passenger ship before it started its maiden season of Mediterranean sailings from Malaga, bringing the comfortable ambience Marella is known for. In fact, passengers who have already cruised on Marella Discovery will feel very much at home on Marella Discovery 2 -- which is a perfect fit for couples and families -- though they might notice a few small differences. Tweaks have been made here and there, and following customer feedback some passenger facilities have been changed, too. The biggest difference is the disappearance of the Breakout and Escape Room. This has been replaced by new Virtual Reality Experience on Deck 3, with new studio rooms where guests can don headsets to transport them into vivid virtual worlds, or pose for pictures in an onboard photo booth loaded with fun backdrops. In keeping with the drive for new hi-tech ways to aid customers is a new onboard app offering a variety of services. Called Navigate, the app enables passengers to monitor their onboard account, check the itinerary and thumb through the entertainment schedules. Users can also glean more information about the ship's facilities, including destination services, the medical centre and shops, though details are only cursory -- mainly giving just a brief explanation and, where appropriate, opening times. 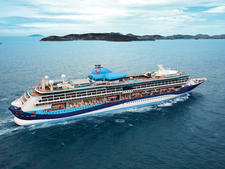 However, Navigate comes into its own for booking extras such as spa treatments, excursions and speciality restaurants. The app is free of charge and, as it is hosted on the ship's own network, it will open on any browser, which means passengers don't have to download it or pay for Wi-Fi to access it. As Marella Discovery 2 has launched as an all-inclusive ship, most drinks are included -- along with gratuities, something for which Marella is already known. They are British through and through, which isn't surprising bearing in mind Thomson's (now TUI) standing and reputation as a leading U.K. travel giant. Many of TUI's loyal customers have migrated from package holidays to try its cruises -- safe in the knowledge these will carry the comforting attributes of the TUI brand, from familiar teas and beers to British-orientated cuisine and activities. However, the arrival of more modern ships, and wider range of facilities they bring, is also attracting more passengers who may have cruised on other lines, but want to keep to smaller ships with less than 2,000 passengers. Many passengers are retired or just below retirement age -- especially those travelling outside the school holidays. But the summer peak brings an influx of families with children of all ages, attracted by Marella Discovery 2's children's clubs as well as the climbing wall, outside film screen, swimming pools and mini-golf. There's definitely a relaxed look and feel to the dress code on Marella Discovery 2. During the day and into early evening it's very casual in the Islands buffet restaurant, the Snack Shack and the Glasshouse, though sunbathers wandering in here are asked to cover up and slip a top on. For dining in the main 47° and Gallery 47° restaurants, diners are advised slip on what they would wear if going out for lunch or dinner -- and definitely no shorts, vests or swimwear. Male guests are requested to wear closed shoes, too. In the a la carte restaurants, a collared shirt and trousers plus closed shoes are also required -- but men do not have to wear ties. Formal nights have given way to "Dress to Impress" -- a more flexible approach that sees ladies wearing anything from jewelled ball gowns to cocktail dresses and summery outfits with men going all-out for full black-tie, wearing a lounge suit or even putting on smart jeans. On the whole, most people make the effort to brush up and look smart. Marella Cruises is one of the few mass market lines to include tips and service charges -- and in case passengers forget, there's even a reminder printed on the room keycard. 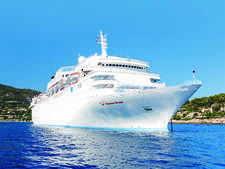 Onboard prices are in sterling, but the ship operates a cashless system and customers have their own account which becomes active as soon as they register their credit or debit card, generally upon check-in. Alternatively, if guests wish to pay by cash, they must deposit £200 per cabin with reception within 24 hours of embarking.